Your Car’s Never Had It So Good! Are you looking for an honest, friendly, full-service auto repair shop in Grand Junction, Colorado? Well, you’ll be glad to know your repair shop search ends here! Simpson Brothers Garage is a family-owned and operated auto repair shop offering complete car service for both American and import vehicles. We also provide fleet service for Grand Junction area businesses. So, whether you have one car or one-hundred, count on us for all your automotive service needs. We’ll get you back on the road fast with a smile! A cool family is a happy family! Our mission at Simpson Brothers Garage is to not only provide you with expert vehicle repairs and maintenance but to also do our best to treat you the way you should be treated—fairly, honestly, and with the utmost respect. We want to earn your business and trust. Without you, we would not have a thriving business, and it’s up to us to exceed your expectations. 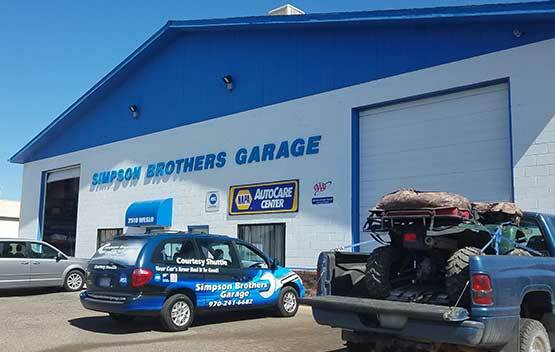 At Simpson Brothers Garage, our goal is to take care of you and provide the best auto repair service in Grand Junction. With 12 bays and seven lifts, our shop is large enough to address your vehicle repair and maintenance needs quickly. Likewise, our experienced mechanics and staff have the skill and know-how to handle everything from squeaky brakes to the most challenging electrical, drivability, and diagnostic problems. We pride ourselves on our professionalism and integrity, and we want you to feel at ease when you come to our shop. Whatever your car needs, Simpson Brothers has you covered! As a NAPA AutoCare Center, we are proud to offer a 12-month or 12,000-mile nationwide warranty on most auto repairs. We’re also a AAA Approved Auto Repair Facility, meeting AAA’s strict criteria for customer service, facility appearance, ASE-certified technicians, staff qualifications and training, fair pricing, business reputation, and more. At Simpson Brothers, We Make Car Service Simple! For your convenience, we offer courtesy shuttle service within a 10-mile radius of our shop should you need a lift to work or home. So, don’t worry about getting a ride—we’ll do the running around for you! And if you can’t get here during regular business hours, not to worry. We have an easy-to-use afterhours vehicle drop-off system. Simply fill out a key drop envelope located in the mailbox by our front door, put your keys in the envelope, and slide it into the mail slot on the front door. Remember to include the best phone number to reach you, and we’ll call you when we open the next day. Simpson Brothers Garage has won the Angie’s List Super Service Award four years in a row! Our auto repair shop is conveniently located at 2510 Weslo Ave. in Grand Junction, Colorado, less than five minutes from Mesa Mall and 10 minutes from Interstate 70. Colorado Mesa University is less than a 10-minute drive from our shop, and we provide auto repair services to many college students, including shuttle service to and from campus. In addition to Grand Junction, we serve the communities of Fruita, Palisade, Redlands, Orchard Mesa, and Clifton. You expect and demand value for your hard-earned money—as you should—and at Simpson Brothers Garage, we aim to deliver. Please call us the next time you need auto repairs or maintenance.